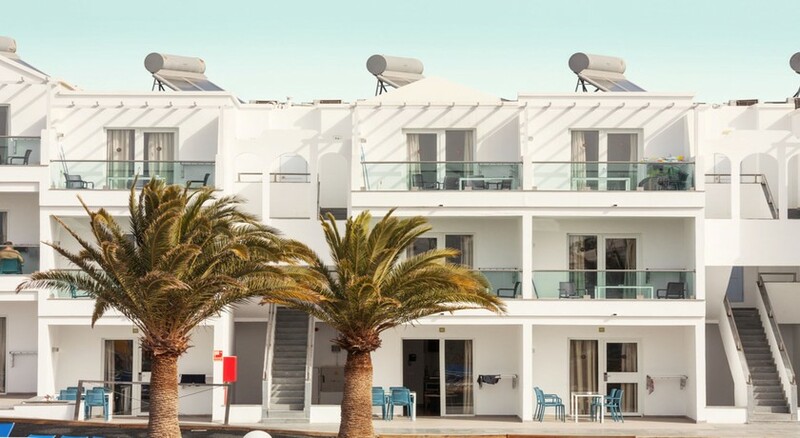 The Plaza Palmeras Apartments are situated on Lanzarote, the Canary Islands, at Puerto del Carmen. Only 200m from the golden sandy beach, the Apartments Plaza Palmeras offers 115 affordable self-catering units, for up to three people, focusing on a sparkling pool and sun terrace. 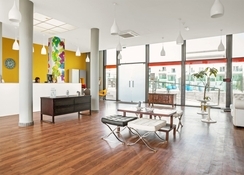 The apartments are bright and cheerful and complemented by a restaurant and poolside bar which hosts live entertainment each evening, a sparkling pool for adults and separate children's pool and beaches and restaurants, bars and shops all within a stroll. Book into the Plaza Palmeras Apartments for a value for money stay on the lovely Spanish island of Lanzarote. Getting to the hotel: 10 minute drive to Lanzarote International Airport. Local tips: These apartments are at the top of a hill and are not recommended for those with walking difficulties. Nearby activities include theme parks, marine excursions, land tours, air tours, museums, golf, marinas, parasailing and other sports. 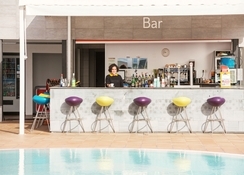 Food, drink and entertainment: Main restaurant and poolside bar has indoor and terrace areas for buffet-style and a la carte service; the poolside bar hosts live entertainment every evening and weekly BBQs. 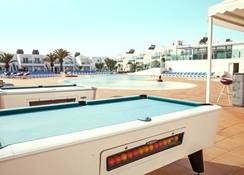 Sport, games and activities: Swimming pool, sun terrace and loungers, pool & billiards; Lanzarote golf course is a 5 minute walk away. Additional: Front Desk services, housekeeping, internet corner and onsite supermarket. The cost of the stay in full must be paid in cash on arrival. Guest apartments are clean and modern with a typically Mediterranean-style decor of white walls, cool tiled floors, comfortable white furnishings and splashes of colour in drapes and fabrics, and modern amenities; features include a private furnished terrace or balcony overlooking the pool, private bathroom, separate bedroom, separate lounge/diner, TV, safe box, wake-up service/alarm clock, and kitchen area which includes a fridge, tea & coffee maker.